The flag of the city of Toledo has a plain field of the same vermillion shade of red as the flag of Madrid city, with complex arms featuring a large golden eagle and a castle in the centre. 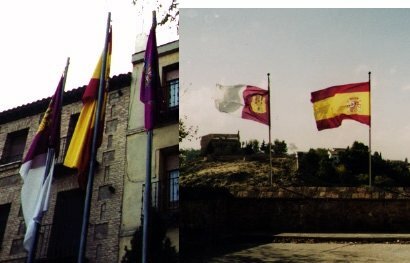 This flag was flying from the Ayuntamiento [city council] along with the flags of Castile-La Mancha and Spain (the latter centered and higher than the others) but it was too wrapped about the mast for me to have a clear view of the arms. Toledo's arms are a grant of Emperor Charles V (King Charles I of Spain) and include the double-headed eagle bearing a escutcheon with Castile and Leon quartered and Granada in point (a pomegranate as in the current Spanish Arms) surrounded by the collar of the Order of the Golden Fleece, the eagle [almost] holding in its talons the pillars of Hercules and the Imperial crown. I am attaching an image of the more or less official version taken from the Diputación de Toledo website (Provincial Council), and a not so correct version (lacks the pillars, the crown does not look very much like an imperial one) taken from José María Valladolid's website. The eagle is generally depicted sable ie. black. Possibly the flag you saw either had a black eagle heavily 'lined' in gold, or it was a wrong variation. The eagle was definitely gold, not black on the flag  that would have looked very Albanian. I couldn't see the escutcheon on the flag, but I saw the municipal arms at a few places around the city and it had the castle alone  at the time I wondered whether it was the castle of Castile or a representation of the Alcázar. Last year I visited Toledo and I have some questions about the flag of the city. First, on the FOTW page for Toledo City it says that the city flag's background is the same vermilion red as on the Madrid City flag. The flags that I saw (see these somewhat dark photos) were much more purplish (reddish purple, or perhaps violet) than those in Madrid (...). The flags of Castile-La Mancha had this same purplish color. (...) It seems to me to be close to the heraldic purpure. My second question is who are the figures on either side of the arms? I do not have a good image of them, the best one I have is on the back of a brochure for the Carolus exhibit from when it visited Toledo (in this case the background of the logo/flag is white). There are two figures, one on either side, both are sitting on thrones and are probably wearing crowns. The one on the left is holding two swords, the one on the right one sword.